Hughes Boat Works, 1979-1982, 1986-? The following specifications came from the original owners manual for Roger Lefebvre's 1977 Columbia 8.3, À Cause ? 100% Foretriangle            206 sq. ft.
Total (100%)Foretriangle     342 sq. ft. The following is from a Columbia 8.3 brochure. It is an explanation by Alan Payne of the hull characteristics of the 8.3 and his Columbia meter designs in general. Chris and Nancy Trautz copied it from the brochure and sent it to the Columbia mailing list. Those of us who have original brochures for our Columbias feel somewhat privilged. Looking at these "ancient" documents transports us back to the days when our vessels were fresh and new. Congratulations on you brochure score. The nice lady would have been Avis Dickerson, wife of the previous owner, John Dickerson, mother of the present owner, John Dickerson,jr. They are terrific people...a Columbia & Atomic 4 Homeland ! Bet you're lovin that original brochure sayin all those nice things about "your boat".
" There has always been the thing that cruising yachts were a kind of watered-down version of current racing yachts. The amount of design thought that has gone into cruising yachts was nowhere near what it should have been. The Super-Cruiser design is intended to be a balance of good handling qualities, safety and ability in rough weather and speed. The interesting and special thing about this design is the very good performance which has been achieved over the whole range of cruising requirements." 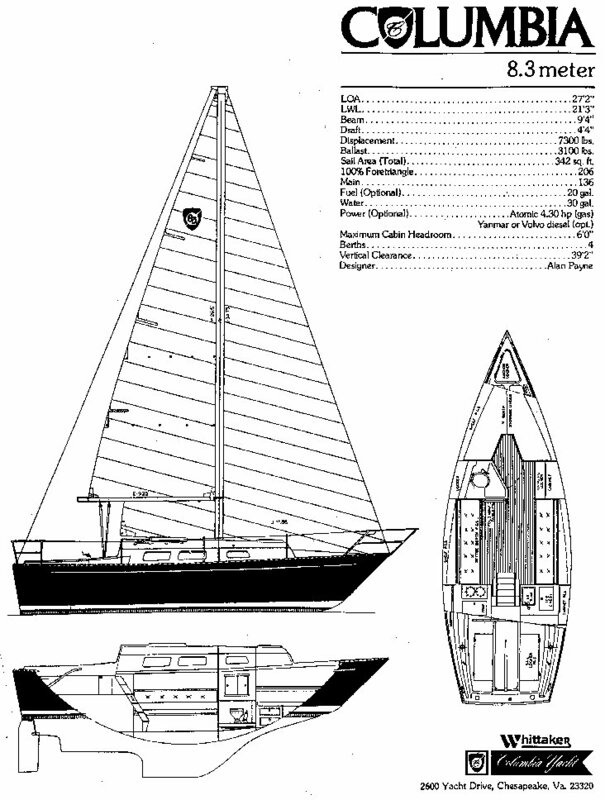 "The final satisfactory result was achieved by combining a wide beam, a flat-bottomed shape amidships with firm bilges, and bow and stern shapes which are different to the shapes adopted nowadays in rather thoughtless imitation of shapes which have been developed to fit the geometry of racing rule." "The bow shape has been chosen principally for it's effect on steering. The U-shape reduces weather helm when the Yacht is heeled and makes the boat much easier to steer in a following sea. On top of the veed stern there is a fairly wide spreading out transom in the style of the early American yachts like the schooner 'America'. 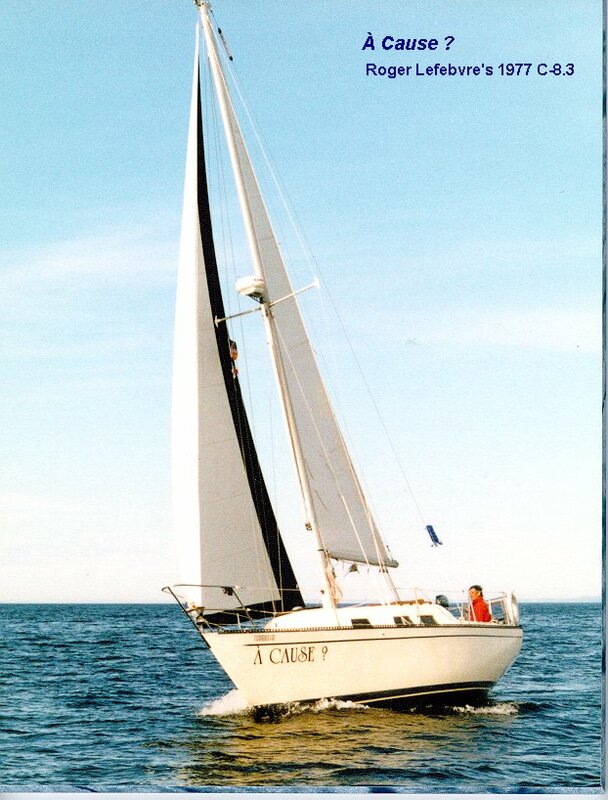 This stern confers useable deck space and acts as a very good pitch dampening device when the yacht is heeled over." "The net result of the bow, midships, and stern shapes is a boat which imparts tremendous confidence in rough weather. It keeps going fast, it has an easy motion, it is dry, and it is easy to steer. It is also stiff and stable and carries it's sail well. It's a boat with which the owner can go on board and find that she is particularly easy to manage in all sailing conditions." It's been reported that with a little sanding a J30 tiller is a good replacement for the stock Columbia unit.